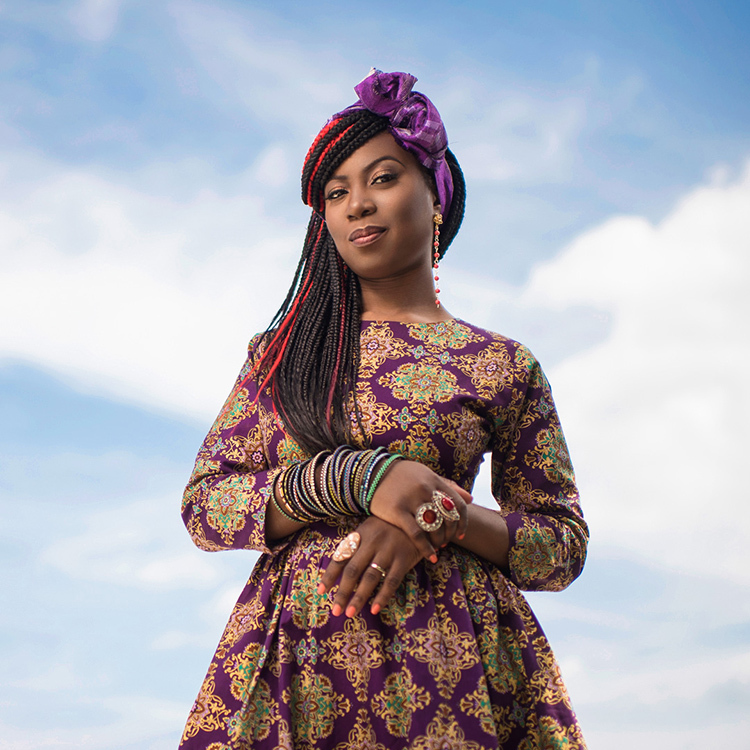 Tolumide is a Nigerian singer, songwriter and graphic artist based in Washington D.C. Her Suya Soul music performances at open mics or festivals has garnered a following. You would quickly notice fans hurrying for a quick selfie before she goes into a venue. She recently opened for french musical duo Les Nubians at the historic Howard Theatre. In this interview she talks about her beginnings and her recent album release. and were part of Women Ah Run Things. Please tell us about that. I studied Fine Arts and Graphic Design at York University in Toronto and graduated in 2001. Before the undergraduate studies began I got a summer part time job braiding at a hair salon. One day while working, my Jamaican boss’s sister Lady Luscious came in to her her hair done. She was a very energetic middle aged women who had just created an all female reggae group called “Women Ah Run Tings” in the mid-90’s. While her hair was being styled she said she was looking for a singer. I started out as a back up vocalist and then eventually started singing more leads..
A fellow college suggested I sing and I auditioned right on the spot and received an invite from her to attend a rehearsal. The rest is history, I was the youngest in the group and it was so much fun to sing, perform and occasionally get paid. I learned a lot about show biz while performing and touring Canada with the group for six years. I started out as a back up vocalist and then eventually started singing more leads. It was an amazing experience and gave me loads confidence to pursue my career and produce albums independently as a solo female artist. You were one of the inaugural artists of the Visual Collaborative platform and have participated in 3 exhibitions. How did this come about? In 2002 I met the creator of the platform Ade Olufeko while he was visiting the Maryland area, he was making a video documentary at a Nigerian youth event (Naijaryders). It was so refreshing for me to meet a fellow Nigerian and Multi-talent Artist and we stayed connected. Five years later, I received an invitation to showcase my artwork at his first curated Art and Design exhibition in Minneapolis, Minnesota, it was a great honor and delight for me to participate and be featured alongside other very talented artists. creative themes or would you say you move with topics of the times? Yes! African heritage is very much part of all creative themes I explore as an artist in my music, fashion, cooking and lifestyle. I describe my music as Suya Soul a phrase I coined to describe the fusion of Contemporary R&B with African music. Suya, being a popular Spicy Grilled Shish kebab (skewered meat) indigenous to Nigeria and many West Africa countries, represents the alternative music flavor I offer to listeners who love soulful music. the Howard, what was the reception of the event? 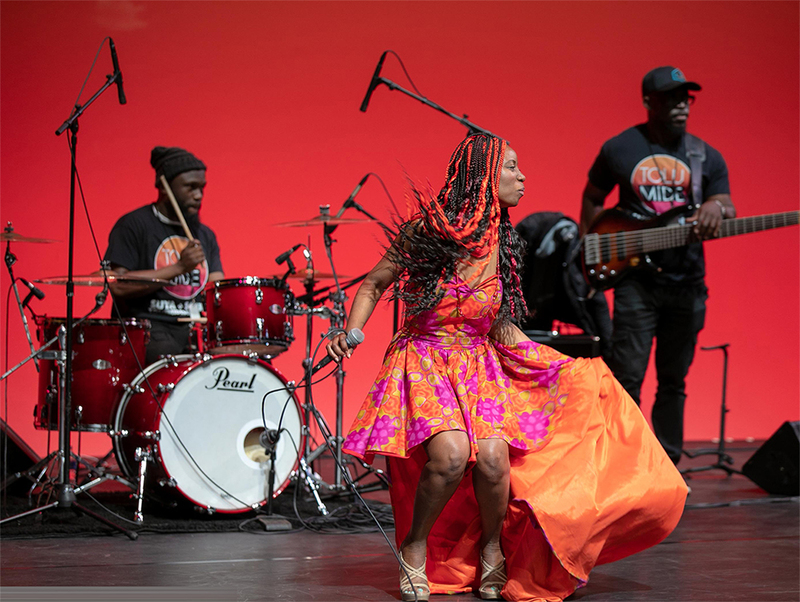 Opening for Les Nubians on December 15th, 2018 at Howard Theater in Washington, DC was an amazing experience. I have been a big fan of Les Nubians since the 90’s and was overjoyed when I received the invite to open perform at their concert in Washington DC celebrating 20 years in music. I performed with my full band of musicians and shared a number of songs from my most recently released album Mama Sunshine and a few exclusive unreleased tunes and songs from my debut album “My Love”. The highlight of the evening for me came when a lady came to my merchandize table and mentioned she missed the show but the attendees beside her raved about my energetic performance and she felt compelled to meet me and support by purchasing my album. still design and how does this work with your music career? Yes I do still design for my music brand and my design company for various clients. My first full time employment after receiving my Bachelor of Art degree in 2001 was at the FOX and Warner Bros affiliate Television Station in Baltimore, MD – USA. I designed motion, still graphics, promotions, marketing and produced live on-air graphics in the control room during live broadcasting. My graphic design and multimedia skills help me manage, market and add value my brand and has been useful for creating an impactful presence in all media. Both quiet and noisy moments inspire me to write. I didn’t study music in school, I just had extensive experience singing in church, at school when I attended University of Lagos Staff School and Atlantic Hall Secondary School, during weddings, and also with Women Ah Run Tings. So when I decided to pursue music as a second career and a solo artist in 2003 I knew I needed to create lyrics I could sing to and I figured I couldn’t go wrong with sharing my thoughts, experiences and sentimental values. Trusting the human element will make the themes and emotions shared relatable. The song “For Me” from “My Love” album released in 2010 was a song I wrote when I was single pondering about dating and my role as a women. a few year later my 2018 release “Your Arms (Fun Mi Layo)” is a song backed by a bubbly, Afro-infused soulful rhythm of a song wrote and sang about the awakening feeling of finding love and accepting its pleasures and securities. It would be the 80s 90s. The era of big hair, fun fashion, pop colors, walkmans and dancing the running man. It’s an era where I could listen to full albums on repeat such as Whitney by Whitney Houston, Don’t be Cruel by Bobby Brown and Rhythm Nation by Janet Jackson. If you could perform alongside anyone who would it be? There are so many artists who I would be so honored to perform alongside with Sade, Anita Baker, Mary Mary, Fatoumata Diawara, Sara Tavares, Lira, India Arie are a few that come to mind. I’ve been inspired by so many female singers of African heritage. My opportunity to perform at the Les Nubians concert last year was certainly a dream come true and i’m looking forward to many more moments to celebrate. What kind of music can the world expect from Tolu within the next 5 years? I will continue to share love, life and laughter with Suya Soul music. My first concert of the year is scheduled for Friday February 22nd 2019 at the Annual Intersections Festival hosted by Atlas Performing Arts Center in Washington, DC. My sophomore full length album “Suya Soul” is to be released in spring and I’m looking forward to more concerts, wedding performances, touring, artist collaborations, and placements in film television and various media. More on TolumiDE can be found on tolumidemusic.com.